One is, more often than not, gripped by an overwhelming curiosity while in front of an author who has penned three non-fiction works on Ayurveda and more recently, a novel, Reenita Malhotra Hora, who slips perfectly into the character of an author, a radio show presenter and broadcast journalist, switches roles occasionally yet all the time effortlessly! She opens the conversation with Operation Mom- How I got my mother a life and a man, her book that has been published by Harper Collins. "Actually, I started writing fiction early in 2007 and that book is yet to be published," she laughs while intimating us with details about her first fiction book, the working title of which is Arya's Chronicles. "As time and luck would have it, it was Operation Mom that got published first while Arya's Chronicles is still doing the rounds at publishing houses. It took me just about three months to pen it down!" she smiles. Reenita explains the shift from writing non-fiction to fiction as she says, "I think fiction is only a twisted version of reality and in my book, all the characters are very real; this is very much my story." Firstly, this is a book about a daughter finding a man for her mother, who is extremely obsessive. My characters are inspired from my Punjabi roots, my mother and my daughter. We have very prominent female genes in her family. It was easy to write the book, but the research process required me to shuttle between Mumbai and Hong Kong. I would often travel in busses and local trains to know the slangs that most of the Mumbai teenagers are using these days. Also, the only way I pulled this book through was because of my husband and family, who gave me ample space to operate. As time and luck would have it, it was Operation Mom that got published first while Arya's Chronicles is still doing the rounds at publishing houses. It took me just about three months to pen it down! Settled in Hong Kong, Reenita produces and presents an award winning radio show Asian Threads, on RTHK Radio 3 along with a non-fiction show, Money for Nothing. Since her book is set in the backdrop of Mumbai, a city she has been away from since 1989 when she moved to California and later Hong Kong, penning it didn't really come as easy to Reenita. "It was easy to write the book, but the research process required me to shuttle between Mumbai and Hong Kong. I would often travel in buses and local trains to know the slangs that most of the Mumbai teenagers are using these days. Also, the only way I pulled this book through was because of my husband and family, who gave me ample space to operate," she shares. The book, which revolves around the life of a single working mother, who is obsessive and protective, much to her Punjabi roots, Reenita speaks of touching upon an idea that beats all stereotypes. "Firstly, this is a book about a daughter finding a man for her mother, who is extremely obsessive. My characters are inspired from my Punjabi roots, my mother and my daughter. We have very prominent female genes in her family," she quips. Reenita likes to keep it dramatic and for that reason, she opts to have her protagonist as divorced and a single mother. "I don't know how conservatism seeped into Indian society. We have always been very liberated; take for example Draupadi of Mahabharat. Divorce has been considered a taboo since a long time and I wanted to vanquish all stereotypes associated with it, but in a very subtle manner." Reenita paints a character, Ali Zafar, in a rather garish tone, as he becomes an object of obsession of the protagonist's daughter. "When I heard the song Who Dekhne Mein by Ali Zafar, I was almost certain that he was talking about the character of my novel," she says. The book is about a daughter, who with her best friend, tries to find a suitable date for her mother. With plentiful on her platter, Reetika shares with us that she still has three more books in the pipeline — one being Arya's Chronicles while the other a fiction novel about three men, which is set in the 80s. "I am penning a non-fiction, the working title of which is Indian Woman's Guide to Personal Finance," she says. Reenita has the tendency to combine extreme contrasts in her style of writing, which derives much from the classics but treated in the modernist school of thought. The little ones with some swell moves have always appeared way too incredulous for reality - the shows where children lock, pop, krump and do whatever it takes to better the stunts they perform on reel! However, it is only the real in person that turns to surreal on stage. Eight-year-old Anushka Chetri of Zee TV's Dance India Dance Li'l Masters Season 3 is reticent, refuses to dance and yawns while doodling Doraemon on a piece of paper. "She is not dancing here because it is a new place with new people, so she is a little reserved," her skipper Sanam Johar says. "We have such long shooting hours and at times, we are really tired. There have been times when she has literally dozed off in my arms. But when she has to perform on stage, she is more than eager to light things up and I am nervous," he shares, while on a promotional tour in Chandigarh. Dig deeper and the love for junk food stays like any other child of her age. He laughs, "She loves momos, eats up 10 to 20 biscuits but she is very hard-working and there is a reason why she is called the expression queen." The Darjeeling girl is only warming to the odd queries being put to her. What do you ask an overgrown toddler? "I only speak Nepali in Darjeeling and I have my mother, father and younger sister in my family…I have been dancing since the age of three and I study in Loreto Convent School," she answers one after the other in a child-like manner and voice befitting her age. The school must be a casualty amidst the long shooting schedules and rehearsals. It's a give and take like with any opportunity in life. "We rehearse and shoot from nine in the morning to nine at night. Efforts are made to make sure they complete their homework on time and every Tuesday is an off, so that the children can catch up on studies," shares the 22-year-old skipper from Delhi, for whom life has turned for good with the third season of the show. "I let the first two seasons go by because I had to complete my high school followed by graduation. Fallback option is really important because it is a field where you can perform only till the time you are healthy. One-odd injury could cost you anything." He adds, "There was a time when only people in my college knew me. Now a lot many more people know; an auto-rickshaw guy even recognised my mother and dropped her off home. The appreciation feels good." Save for the choreography stint in the film ABCD or the upcoming ABCD 2, dancing it is for now. "I'm only 22 and as of now, I only want to dance." Keep it going! Saqib Saleem is a garrulous 25-year-old and an actor by accident! Gearing up for the release of his movie Hawaa Hawaai, Saqib talks of his life and being plain 'lucky'. I play a skating coach in Hawaa Hawaai. It is way different from the urban, happy-go-lucky roles that I have essayed so far. I had to act mature and loved the challenge. However, it was director Amole Gupte who made me say an immediate yes. To get him as my director at such a nascent stage is just awesome. I used to play roller hockey in school before I picked up cricket, which I have played at the state level, but I had left it for long. For Hawaa Hawaai, I had to learn and unlearn a lot of things. But the experience was worth it. It is a movie based on sports. It's also about dream chasers, as goes the tagline of the film — Kuch sapne sone nahi dete. I totally go with it; if you want to achieve, you got to dream! Alongside graduation, I was happy modelling and assisting my father in his restaurant business. I was also dating my senior from college, who aspired to be an actor. She moved to Mumbai and told me if I wanted it to work, I would have to shifty my base. Convincing my parents was a big deal, but with a promise to return after a year's break I set off for tinsel town. In a very filmy manner, we broke up soon after. Mumbai changes people, she was not the same and the same applied for me. I modelled, did some shows and earned my living. And just when my father asked me to come back to Delhi to keep the promise, I got call from YRF. The entire family is now proud of me. I consider myself plain lucky. From a middle class family in Delhi with no connections in Bollywood, my first two films are with the one biggest production houses — YRF. I was directed by Karan Johar next and now Amol Gupte. For someone like me who has done no theatre or attended no film school, it's a huge thing. One dream that gave me sleepless nights is playing cricket for India. I did play at the state level, but thankfully, in time, I realised I wasn't that good. While I have walked the ramp for fun, acting has so far worked for me. I want to play different characters. I did Bombay Talkies, which many would not have and I am all set to take chances again. Huma Quershi is my sister and we exchange notes, but we are each other's harshest critics. We are honest and keep motivating each other. Picky is particular when it comes to choosing her work. A versatile artist, her art is about positivity, happiness and optimism. "Whether the work is abstract, pop, modern or rebellious, the tone remains positive," says this Ludhiana-based artist. Picky does not restrict herself to the canvas alone, but passionately paints walls and other surfaces as well! She has been participating in the India Art Fair and has mostly showcased her work in group exhibitions. Associated with Progressive Art Gallery, Mumbai, she is experimenting with installation art. "Installations are rapidly becoming popular and are a shot in the arm of an artist; anything can become a medium of expression for an artist. One only needs enthusiasm to tap one's creativity," says this self-taught artist. As an artist and a person, Picky is a free soul. Not bound by tradition, she lets her mind soar and gives wings to her creativity. When she is not painting, Picky likes to use her talent on clutches and purses! "This takes art to the wardrobe and lends class to it. The artwork is lasting, but surely needs to be treated as a piece of art," says Picky. Her clutches have adorned the hands of Monica Dogra and Alia Bhatt! The artist has also associated with designer Reena Dhaka. It’s time to wear your apron, pick up your knife, bring out the appliances you've forgotten you had at home and brush up your cooking skills! History TV18 is ready to whet the appetites of the Indian audiences with Miguel's Feasts, a show hosted by the new superstar of the Australian food scene Miguel Maestre. The show follows the smiling Spaniard on the road as he tastes the luscious secrets of multicultural Australia. Miguel pursues his passion for creating beautiful cuisine around the world. On his travels, the irresistible chef meets the proud primary producers who are obsessed with quality, learns how to milk goats; makes cheese and digs up mud crabs. He also reveals the secrets of how to create everything from the perfect Portuguese tart to an unrivalled rice paper roll. From meeting Australian restaurant royalty to the donut queens, the vegeburger kings and the best apple pie-making mums in the land, Miguel is here to narrate exciting tales from his epicurean journey. 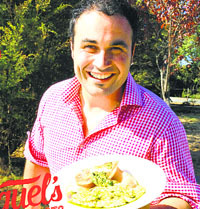 Join Miguel Maestre on Miguel's Feasts every Monday to Friday at 2 pm only on History TV18. Side swept curls, pearl strings, chiffon sarees and lace blouses — that’s what comprises Simone Singh’s new look in Star Plus’s latest offering Ek Hasina Thi. Simone, who is making a comeback on small screen as an affluent and powerful Sakshi Goenka of Ek Hasina Thi, has been actively involved in styling her onscreen character. “My character Sakshi Goenka is quite the style icon. The makers wanted Sakshi’s look to be distinct on screen. Her persona is contemporary and elite; she has an aura of strength and grace. Hence, we decided to go vintage chic with my look. There is a classic charm and mystique around Sakshi Goenka. I have been getting a lot of admiration for my look and am delighted that my biggest admirer is my husband!” says Simone. Vintage or no vintage, we are sure that more than her looks, Simone would steal the show with her killer smile only! Tune in to Ek Hasina Thi starting April 14, every Monday to Saturday at 8:00 pm only on Star Plus. Himanshu Soni, who plays the title role in BK Modi's Buddha on Zee TV, got to meet his holiness The Dalai Lama in Dharamshala on April 2. The show has been talked about for its unique subject, the performances and costumes. Buddha has been a source of inspiration for millions of people across the globe. Besides Himanshu Soni, creative producer Ridhwana also met him. Himanshu says, "The aura of Dalai Lama was amazing. He is such a positive person. Meeting him was like a dream. I was mesmerised by his sheer presence. In the show my character is under the process of transformation from Siddhartha to Buddha. From the time I started doing Buddha, it has been my heart's desire to meet The Dalai Lama. Since producer BK Modi is a follower of Buddha and Dalai Lama, I got an opportunity to meet him in person. I feel lucky as well as blessed." Aastha and Shlok are nervous and anxious as the day of their divorce hearing in court has approached. Vinayak gets upset as he comes to know of it. Aastha calls Kalindi and asks for her support. She asks Niranjan to pardon her for any mistakes committed intentionally or unintentionally. The Agnihotris and Kirloskars meet at the court. Aastha & Shlok sit infront of the judge where he asks both of them about their decision with regards to the divorce. Do they want to be separated or be together? To know, keep watching Iss Pyaar Ko Kya Naam Doon.... Ek Baar Phir only on Star Plus at 6 pm. After Manish Paul's exit from Mad In India, Chunky Pandey is the new addition. However, he won't be hosting the show a la Manish but playing a similar role like Sidhu in Comedy Nights With Kapil. Sunil Grover's comedy show has too many similar elements with Kapil's show for it to be a coincidence! Sara Khan and Parul Chauhan, who became close friends after working in the show Sapna Babul Ka...Bidaai, are apparently not on good terms now. Producer Rajan Shahi tried to get them together for a cameo in his ongoing show Aur Pyaar Ho Gaya, but it wasn't to be. Puja Banerjee, who plays Parvati on Devon Ke Dev Mahadev, will soon return to the show. She was absent for almost two months as Sati's track played by Mouni Roy was on air. She enjoyed her break and shot an episode last week. Deepika Singh of Diya Aur Baati Hum fame, who recently announced that she would get married to her director Rohit Raj Goyal, has now set the wedding date. She will marry on 2 May in Mumbai. They will go for a brief honeymoon. 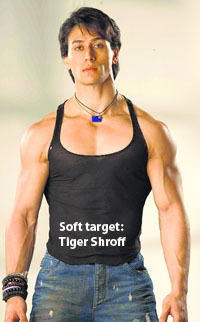 Tiger Shroff-starrer Heropanti's trailer has got positive reviews and great buzz. Tiger is an introvert and mild-mannered. He talks about movies, girls and more. I am a boring, not-so-cool guy, who is uncomfortable in a crowd and feels lost in a party. And now I am going to lose the few friends I have as I can hardly get to spend time with them these days. I don't take even a day off. Even when I am not shooting, I go for my martial arts training to SAI (Sports Authority of India) in Kandivli. Also, I attend Paresh Shirodkar sir's dance classes in Badlapur. I wanted to be an athlete but after school, I started getting lots of movie offers. So, I thought that why not give acting a shot? I liked the script of Heropanti because it gave me an opportunity to showcase my skills as a dancer and an acrobat. I thoroughly enjoyed the shoot. It took them a long time to zero in on a heroine so during this time, I attended workshops. Sajid Nadiadwala, the producer, took good care of me. Kriti is a very pretty woman but I had to stay focused and not get distracted. I haven't chosen an easy profession. I remember the film's director Sabbir Khan introducing me to her, saying that I'm a 'shy boy'. I was okay doing the intimate scenes but I needed a few rehearsals (laughs). I am an actor who loves to practice before facing the camera. I have had many affairs but I don't have a very good track record with girls. So none of my relationships have lasted long. Nargis Fakhri has just returned to India after wrapping up the first schedule of her Hollywood film, Spy. Directed by Paul Feig, the film co-stars Jason Statham, Melissa McCarthy and Jude Law. I met Jude and a couple of other actors too. He's pretty nice and normal, and Melissa, who's playing the lead, is really funny. They are really regular people. My role is a small but action-packed one. The punctuality almost spooked me, as a five-minute delay for an 8.45 am pick-up time was met with an urgent 'where-are-you' phone call. The discipline there is awesome. Everything is so organised and so different from the way we work here. But I love Bollywood. I have no idea how Akshay feels since I've never spoken to him. I really tried to accommodate Shaukeen but there were date issues. I had to make a decision. It's my life, so I should be the one to decide what to do with it. Regarding Main Tera Hero, I was only away for a couple of days and now I'm back with them. After Kareena Kapoor and Vidya Balan, it is now Genelia D'Souza under the media scanner for pregnancy issue. According to the grapevine, the Jaane Tu Ya Jaane Naa actress is expecting her first child with husband Riteish Deshmukh. The news caught fire when Genelia was spotted in an anarkali salwar recently. The news was further fuelled when shewas spotted with a little baby bump at the screening of Riteish Deshmukh's Marathi venture, Yellow. Genelia's baby bump was quite evident in a black T-shirt and jeans. Guess we will still have to wait. Deepika Padukone and Ranveer Singh have made their final choice. Both of them will dedicate most of 2015 to Sanjay Leela Bhansali's Bajirao Mastani and hope to recreate the Ram Leela magic again. They chose this film over Karan Johar's Shuddhi. Sonam Kapoor says that she was never offered Raees and will not talk about movies that she is not doing or has turned down. That is because it is unfair to the people who are doing it and it is a tacky thing to do. It seems that Aditya Chopra is unhappy with some portions of Daawat-e-Ishq starring Aditya Roy Kapur and Parineeti Chopra. He wants those scenes to be re-shot. Sonakshi Sinha is all praise for Arjun Kapoor and his professionalism on the sets of his home production, Tevar. She has known him since school days and now they have become friends. Irrfan Khan and Mira Nair are all set to team up again for a film almost eight years after The Namesake. The film is called The Bengali Detective and it is about a middle-aged detective keen to learn contemporary dancing. Irrfan is all set to play a Bengali babu again under Mira's direction as the film is set in Kolkata. After The Namesake, Mira directed Irrfan in a short film with Natalie Portman in the lead. Mira approached Irrfan for The Reluctant Fundamentalist but the actor was not keen on playing a terrorist. Saqib Saleem and Huma Qureshi have bought a huge apartment in Mumbai and will have a housewarming party before they move in and decorate it. They will also invite their parents over to stay with them. Irrfan Khan and Kangna Ranaut will star in Sujoy Ghosh's next film titled Rani Durga Singh. ARIES: The recent burst of enthusiasm has run out of steam temporarily and pausing to catch your breath is okay. Make this an easy day on riding anything that needs concentration and effort. Tarot message: Put your terms and conditions in writing. TAURUS: Parents can experience a degree of stress and tension involving children. Making money and having fun are not a good mix now. Stick to earning a living and leave entertainment for later. Tarot message: You find within yourself a fountainhead of will-power. Lucky colour: Rainbow-pastels. Magic number: 21. GEMINI: Sweeter moments are in store during the day. Shopping for a gift as a token of affection is a delightful way to spend money. You will find people generally hard to pin down. Tarot message: Do what is right and watch your best interests. CANCER: Fashion accessories enhance your look at a little cost. Spending on health makes sense. Enduring relationships can be formed with new people who live at a distance. Tarot message: Focus on professional changes. LEO: Do not get involved in any mutual venture blindly without investigating the economic situation of the other party. Give your creative talent an airing. Hobbies will give you much satisfaction. Tarot message: Share responsibility with others before continuing. Lucky colour: Metallic-grey. Magic number: 26. VIRGO: Anticipate a bit of craziness creeping into your day and surprising you like a cosmic jack in the box. Avoid gossiping because it can spoil your chance of success. Tarot message: Think positive and be optimistic. LIBRA: Plans for a romantic rendezvous can be disrupted by a call from office. Do not be afraid to get things off your chest. Go along with the wishes of your family members. Tarot message: You gain by being practical; don't be emotional. SCORPIO: If single, you are likely to find a partner today. Pay more attention to your health. Do not take on chores that will tax you physically today. Keep your sense of humour alive. Tarot message: Focus on your emotional and spiritual life. SAGITTARIUS: Your card 'Three of Cups' suggests that emotions have to be controlled. Compassion and forgiveness are needed for love to keep growing. Partners will not agree with your plans. Tarot message: At work don't hold back anything from your employer. CAPRICORN: Rise early and exercise to get your energy flowing. Walking or running will suit some of you. Yoga or meditation may appeal to others. A domestic hassle is settled amicably. Tarot message: By applying yourself you can build great success. Lucky colour: Golden-brown. Magic number: 59. AQUARIUS: Today attention revolves around your home, property, family and long range decisions. Money rolls after lunch. Keep moving ahead with the progress you have made so far. Tarot message: Focus on the better to mitigate the bitter. PISCES: You should be very satisfied with what is being accomplished. Soon enough you will be ready to show the world what you have been working on. For now, stay with the task in hand. Tarot message: Work hard to achieve success. Number 9 and Mars make you assertive as well as authoritative. This allows you to handle unfavourable situations easily on any front. The year promises a happy and serene domestic life, as prosperity reigns. This is because you will be financially well this year and also be able to save. It is a good year for academic achievements. Health-wise, the period seems satisfactory. A chance of going abroad for some students may materialise this year. An influential person will grant you a favour. November and February are significant months. Positive colours: Golden, Red, White, Yellow and Cream. Select days: Tuesday, Friday and Thursday. Favourable numbers: 3, 6, 9. Gems recommended: Red Coral, Yellow Sapphire. Charity on birthday: Donate green fodder to cows and copper utensils the needy or at any religious place today. You share your birthday with Kristen Stewart (April 9, 1990, USA), who is a very young and talented American film and television actress. She debuted in 1999 with a minor role in made-for-television film The Thirteenth Year and after two years she appeared in The Safety of Objects. She rose to fame with the movie Panic Room. Having youthful skin is every woman's dream. When lines start appearing, ones effort to keep it supple becomes more pronounced. By starting the regimen early in life and using the modern techniques and creams available, we sure can push our age back. Regular use of sunscreen lotion is important. It has to be applied half an hour before you go out in the sun and one coat gives you protection for three hours. It has to be applied on cloudy days also as up to 80 per cent of UV rays can penetrate the skin even on cloudy days. Half of the battle against ageing is won if we use sunscreen everyday. Even at home sunscreen can protect your skin from the domestic lighting. Dryness in the winter also adds to wrinkles. A good oil based or water based moisturizer depending on the type of skin helps in a long way to prevent the formation of lines. If you ever see ladies from the hilly region, you will find lined faces at an early age. Night cream which is anti-aging can be applied but we have to be careful. It is not to be applied near the eyes. All these creams are not to be rubbed or massaged. A thin layer of moisturizer applied underneath helps to get the effect better. Vacuum facials or microderma abrasion helps in smoothening the skin and taking away the dead cells. They are done with aluminum chloride crystals and are repeated fortnightly. It produces immediate glow. Axils laser, which combines non- ablative radio and ultrasound, is also an effective method for a non-surgical face lift. This machine is completely painless and tightens the skin and reduces localised collection of fat by lymphatic massage. Aging can not be prevented entirely. But one can age gracefully and improve ones physical appearance. So why not look young while we can? Tie and dye is a process of folding, twisting, pleating or crumpling fabric or a garment and binding with string or rubber bands, followed by application of dye. It is a simple process of creating colourful patterns on fabric using the resist method. Today tie and dye is not just limited to clothing, it's being used by interior designers, world over, to create stunning effects. 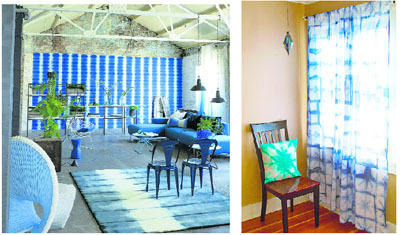 Curtains: Tie and dye curtains look stunning and can easily create a focal point in the room. Use bold colours for children's rooms, kitchens, utility rooms and tone down the shades for more formal settings. You can even limit yourself to just two colours to create a sophisticated look. Carpets or rugs: If you have a subtle room with a clean look, using a patterned rug can really add a pop of design and style. Under the coffee table, in the hallway or foyer and even in the bathroom. Using a monochromatic pallet, then adding a pop of pattern on the floor can really do the trick if you're looking for a more unique look without changing too much. Wall art: A beautiful piece of tie and dye can be framed and used as wall art to create a stunning focal point. Adding a tie and dye art piece to the walls will lend the room a pleasant contrast that is soothing, meditative and inspiring. Throw pillows and cushions: If you are scared to try the bold look of tie and dye, go for something small instead. Throw pillows and cushions are a great way of incorporating the tie and dye effect in your room without going overboard. Runners: In the dining room, a simple tie and dye runner with matching napkins look great. When it comes to decorating your home or commercial space with tie and dye, you want to be sure that you keep in mind a few key rules about decorating. First, you want to aim for a strong sense of balance. Tie and dye can create a vivid visual effect. Think of the swirling designs and the primary colours and find the right placing to give it the best showcasing with the ideal harmony and light. You can even combine different versions of the tie dye art to create a sort of mix and match effect that invokes a sense of beauty and well being. The transformation is amazing. The minute he gets on the stage, this soft spoken singer transforms into a live wire. His high-pitched voice casts a spell. Ranjit Singh Bajwa from Gurdaspur poses with his award, which he recently won at PTC Music Awards for the best song Jatt Di Akal in the folk category. "Last year, I watched the awards on the TV and this time I was performing there," Ranjit says making no effort to hide his childlike enthusiasm. Ranjit did his MA in Music before he plunged into his passion, singing which is what defines him right now. Performing in front of a live audience almost everyday, Ranjit Bawa, as his fans know him, has a new life to look forward to. I sang Bol Mitti Dey Bawaeya at university for a long time, so everyone started calling me 'Bawa'. The success of my track Jatt Di Akal has changed everything for me. It has been appreciated by one and all. I would love to be known as a folk singer. I feel we need singers who can keep the rich heritage alive. Besides, as a singer, I would sing songs that appease my heart and my fans as well. I would either have been a schoolteacher or serving in the police. Arif Lohar and Idu Sharif are the two people who I look up to. I would love to collaborate with them one day. Bol Mitti Dey Bawaeya…. It's a soul song. Arif Lohar, Lakhwinder Wadali and Idu Shariff. I am fond of their music. Performing live is like oxygen supply for any singer. My best live show has been at the music awards this year where I was performing in front of the entire music industry. From ice cream. I have never tasted ice cream in my life. I am a vegetarian and I also avoid anything cold. I pray to God to help me with the performance. And two days before the performance, I plan the sequence of my songs which inevitably changes during the performance. I am regular with gym and jogging. It is a must for me since I have to perform live almost everyday. Someone told me once I could be the next Alam Lohar of Punjab. Trans fat is a type of unsaturated fat that behaves like a saturated fat because of its chemical structure. It increases the risk of heart disease by increasing the "bad" LDL cholesterol, while also lowering the "good" HDL cholesterol in our blood. Naturally occurring trans fats are found in small amounts in dairy products, beef, veal, lamb and mutton. Artificial trans fats or synthetic, industrial or manufactured trans fats are caused by the way some fats and oils are processed. They are found in foods that use hydrogenated or partially hydrogenated vegetable fats, such as deep-fried and baked foods. Studies have shown a link between a diet high in trans-fatty acids and weight gain. Further trans-fat have been clinically proven to cause weight gain, even when the participants were consuming a diet that didn't include enough calories to maintain their weight. Studies have further proved that trans-fat not only triggers weight gain but it also results in transferring the fat stored throughout the body to the abdominal region. Abdominal fat deposition is an established risk factor for cardiovascular disease, and TFA intake is positively associated with a modest increase in waist circumference. Since trans-fat is cheaper and significantly prolongs the shell life of foods, it is used in food processing. It is also used in restaurants, mass produced bakery items, and fast food restaurants because of its longer shell life. Trans- fatty foods tantalise your taste buds, then travel through your digestive system to your arteries, where they turn into sludge. These trans-fats raise LDL the 'bad' cholesterol and increase the risk of heart disease. These trans-fats also lower HDL, the 'good' cholesterol and may do more damage. The American Heart Association advises limiting saturated fat consumption to less than 7 per cent of daily calories and trans fat consumption to less than 1 per cent. Many food manufacturers and fast food chains have removed or reduced trans- fat. Carefully read the nutrition labels and chose brands that don't use trans-fats. Avoid products that list partially hydrogenated fat or oil on the label. Include lots of fruit and vegetables in your diet. Use fat-free or low-fat dairy products. Try to eat fewer biscuits, cakes and pastries. Use liquid vegetable oil for frying at home. Products that list partially hydrogenated fat or oil on the label. Fast food, soup and instant noodles. Packaged puddings, baking mixes like pre-mixed cake mixes, pancake mixes and chocolate drink mixes. Frozen food, frozen creamy foods or creamy beverages. The interesting thing is that many from my fraternity are contesting. Film personalities have contested before, but never so many! In fact, I was offered a candidature too, but I guess one I'm not ready for it yet as it's a very responsible job and besides, my hands are full with something I really love--acting! Politics requires you to give your best. The energy, dedication! This time more so to bring in the ideology we believe in. Are not we lucky that we are a democracy and we have the right to choose? So, why not choose from your heart? Rather than follow a herd for any other reason! Wherever I go, shooting, gym, flights… all everyone seems to talk about is, 'so who do you think will win' and then a debate invariably starts. This time there are newer parties too along with the older ones. No party has left anything to chance! But this time, be very careful when you vote. Especially those in the rural areas. When I saw a huge gathering, I asked someone why were they there? Madam, wherever they get free food and drinks, they go. They are poor people and that scared me! Those are not the voters we yearn for. They need awareness. Innocent people who don't understand a good leadership. They are only concerned about their basic needs! On the other side, this time the general public is aware too. Like a promo of a film, they see a promo and they know if they want to watch it or not. I think similarly people know what they want. All I request is go with what your heart says. Vote for the one who you think will be a capable leader. I'll wish all the best to the candidates more so from my fraternity. May the best one win! But more than that I wish you the people or rather, we the people, all the best to bring in the best! Let the patriotism take priority this time. Let's be proud of our choices. Jai Hind! While in conversation with Yashika Nayyar, we stand informed that there are two kinds of books-books which she says are must read and that then there are books that fall in the category of the perfect book. "When I began writing my first book, I was certain and clear that I didn't want to write a Pulitzer winning book, but a book that people would want to read," begins Yashika, a commerce student at St Xavier's School, who just released her first book titled A Tug of War. "Often, when my friends would come up to me and discuss their issues about not getting along with their parents, I would wonder that there had to be a way that could possibly help them out," she says. "This is the main reason why I penned down this book, the contents of which discuss the vacuity of fighting with parents and it is a teenager's guide to forming happy and healthy relationships," she adds. Yashika shares that it took her almost a year to write the book and that she really had to struggle with it. However, her shortcomings and times of uncertainty were bandaged and nursed well by her teachers. "There were times when I wouldn't want to write, and even when I would, the copy would be full of mistakes, since it is my first book and I was extremely nervous. In times as weak moments as these, I was supported by my teachers," she says. Yashika never really wanted to become a writer, "I wanted to work in a corporate sector, but once I started writing the book, I didn't feel like stopping and the days when I wasn't writing, I felt like my days were going waste," she says. With a wish to write a Pulitzer-winning novel someday, Yashika signs off, leaving us with a thought that it's never too early to dream big. And then, there are some dreams that do come true! Her family has kept Simmi Marwaha (Surinder Kaur) alive long after she left for heavenly abode. A young journalist, she was on duty when hit by a private bus driver. Eleven years on, Simmi has been kept alive by her well wishers in a unique manner. This year too her birthday on April 3 was celebrated by giving honours to young journalists. 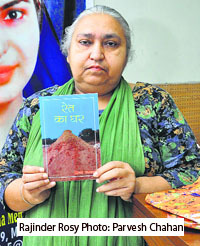 Also, a compilation of poems Rait Ka Ghar was released by her mother Rajinder Rosy who has done a couple of poetry collections and translations. The trust set in her name does charity works for sick and old and also provides assistance for those injured in road accidents. Rait Ka Ghar is a collection of 12 poems, nine written by the budding journalist herself. While Mera Ghar is about the plight of a girl who finds home neither in her parent's or in-laws place; Tamasha is on a hit and run case. There are three poems dedicated to the girl too, capturing her sweet yet strong nature. Preeto Sawhney, a colleague of Simmi, remembers her friend, "We were working together for a TV Channel. She would pick me up for office and drop me too. That fateful day she did drop me at work but didn't take me along on her journey," says Preeto who has continued to tie rakhi to her brothers. Simmi Marwaha Memorial Charitable Trust continues extending a helping hand to the needy in her memory!